1981. 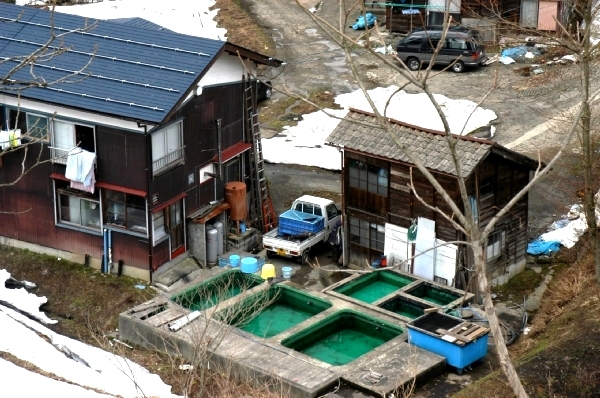 Hiroki Koi farm – Koguriyama Village. Masaki Hiroi, known simply as ‘Hiroki Yorijo’, lives in the most beautiful village in Yamakoshi and his outlet is one of the most perfect settings I have ever seen. I was first taken there by Megumi Yoshida and Kozaburo Miya. His lovely house in Koguriyama is situated near to some very sacred shrines which are regularly visited by the monks in the area. He has a welcoming personality but can appear to be shy on one’s first meeting. Masaki produces very high class Go-Sanke as well as some outstanding Shiro Utsuri and some other varieties. He keeps them in excellent conditions in both his two indoor greenhouses as well as in his outdoor concrete ponds. His water quality and clarity is always good every time I return. He also has 50,000 square metres of mud pond space in order to grow his stocks in the summer months.